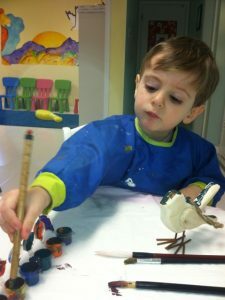 Our art classes for kids include painting (acrylic, watercolor, and oil pastel) on paper as well as on canvas. We focus on developing a sense of color, composition, and self confidence. Our drawing classes focus on linear perspective in drawings, such as line of horizon, diminishing of the objects, and air. We also develop pencil drawing skills, with a sense of the line, shade, and tone. In addition, we offer open-air classes to promote mood, color, and freedom of vision. In our sculpture classes, our instructors teach form, shape, and dynamism in sculpture. We also include art history in every lesson as informational support. We ALWAYS take an individual approach to each student. Feel free to look at our photo gallery for examples of students enjoying doing their artwork!